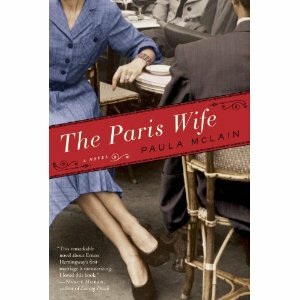 Oh my goodness, I am IN LOVE with The Paris Wife (Random House) by Paula McLain! This book just came out last month and it is terrific! 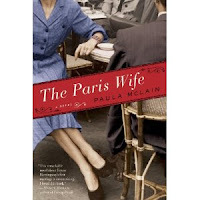 This gorgeous novel is a fictionalized account of Ernest Hemingway's time in Paris, told from the perspective of his first wife, Hadley. I have been totally immersed in this book all week, canceling plans and curling up on my couch every night to read more about Hadley and Hem's doomed relationship. McLain has her MFA in poetry, and she combines that background with historical facts and actual samples of Hemingway's works to create a beautiful and believable world. The writing is poetry, the characters are complexly flawed, and the overall book is just delicious. Not only does McLain give an insightful look at one of the greatest writers of all time, she also shows what it was like to be a woman in the 1920s, and portrays an interesting look at the Lost Generation. This book is perfect for fans of Loving Frank by Nancy Horan and is one of the best books I've read in a long time! We named one of our (now) 22 month old twin girls Hadley (the other is Emerson). We thought we were picking an unusual name, but have met several young Hadleys since our daughters were born. Wonder if this will increase the popularity of the name? (Hope not!) Can't wait to read it...this is the second reference to it I've seen today! Alan Gratz is Coming Saturday!!! Doreen Cronin Is Coming Tomorrow! Fantastic new picture book alert! Congratulations to Pete the Cat! Lemonade Mouth Comes to TV! Little Shop has gift baskets! A Book Review by Madison Castle!